Manufacturer of insulating ceramic house paint and insulating house paint additives to create a heat reflecting barrier. Reviews and Comments for Hy-Tech Thermal Solutions, LLC. Insulating paints and temperature reducing paint additives. Features a range of technical and application data. manufacturers of insulating materials, pressboard din, transformer board, teflon tapes, polyester films, kapton film, insulating varnishes and kheddahide press boards. from india. Manufacturer of paint paddles, paint mixing sticks and associated items. supplier of insulating tube, adhesive tape, mica sheet and tape for cables, epoxy glass laminate and insulating materials. Retail and wholesale paint manufacturer, with over 130 stores in 9 western states. Paint chooser and calculator contained on site. Architect, designer, industrial, contractor, and consumer sections. Offers opportunities in paint touch-up and repair, paint perfecting, paintless dent repair, gold plating, and glass repair. Offers paint sprayers and paint-spraying equipment, parts, and accessories. Provides approved protective paint and coating products. manufacturer and exporter of art and craft items including brushes, kits, sandpaint, paint-by-number and face paint. Alliance aerospace paint and coatings. Products, services, data sheets, government sales, certified paint shops, and contact form. Manufacturer of paint removers, pressure sensitive adhesives, epoxy coatings, and paint, located in China. Sri Lanka-based exporter of paints and coatings. Includes company profile, product information, and business philosophy. Manufacture and distribute paints and supplies for commercial and residential requirements. Offers a full line of interior and exterior paint, stains, and finishes. Turn key industrial paint finishing system contractor specializing in customer paint systems. Paint booths, sales, service, installation. For cars, trucks, industrial, and aircraft. makes patented touch-up paint for golf club repairs, refinishing and refurbishments. Supplies soldering flux, compatible lubricant and cleaner for radiator manufacturers. Also paint remover and cleaning chemicals for paint manufacturers. Aerospace paint and coatings. Products, services, data sheets, government sales, certified paint shops, and contact form. Offers colour creations, colour, paint guides, dealers and brochures. Factory in Shah Alam, with branches in Johor Bahru and Kota Kinabalu. Manufacture chemical products for paint booth operations. Product line includes metal cleaning and preparatory systems, plus a hazardous paint waste detoxifier allowing standard landfill disposal. USA. Developers of color sample cards, fabric swatch books, and paint chip brochures for textile, paint, automotive, and building and construction applications. Technology, processes and news for the paint and coatings industry. Canada. Custom design, engineering, manufacturing, and construction of manual and automated industrial paint finishing systems. Applications include metal, wood, and plastic parts. Germany. Designs and supplies paint systems for wide range of manufacturing requirements. Includes turnkey equipment for wet, dry, and electro coating applications. Site provides details of available products and capabilities. Includes HVLP, cup gun, paint sprayers, linestriper, electrostatics, air guns, pressure pots, gas and electric paint sprayers, airless guns and accessories. If the business hours of Hy-Tech Thermal Solutions, LLC. in may vary on holidays like Valentine’s Day, Washington’s Birthday, St. Patrick’s Day, Easter, Easter eve and Mother’s day. We display standard opening hours and price ranges in our profile site. 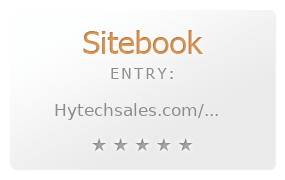 We recommend to check out hytechsales.com/ for further information. You can also search for Alternatives for hytechsales.com/ on our Review Site Sitebook.org All trademarks are the property of their respective owners. If we should delete this entry, please send us a short E-Mail.